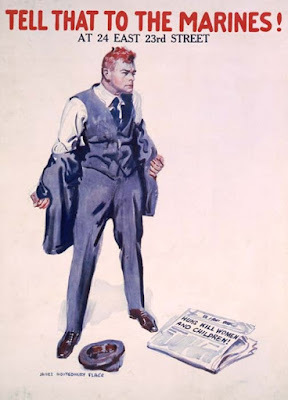 Gurney Journey: Flagg's Poster "Tell That to the Marines"
How Do You Get a Book Published? How did you prepare for your career? Flagg's Poster "Tell That to the Marines"
James Montgomery Flagg is best known for his poster of Uncle Sam pointing and saying "I want YOU for the U.S. Army." 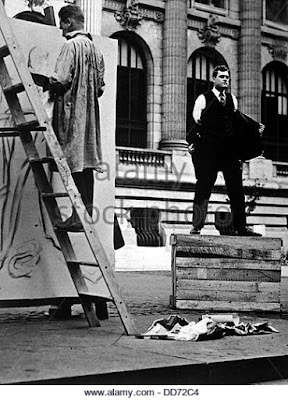 He painted many other recruitment posters for World War I, some of which were staged as publicity stunts. He set up his oversize canvas in New York City and climbed up a ladder as a model stood on a box. The steps of the New York Public Library became the main location for these events. 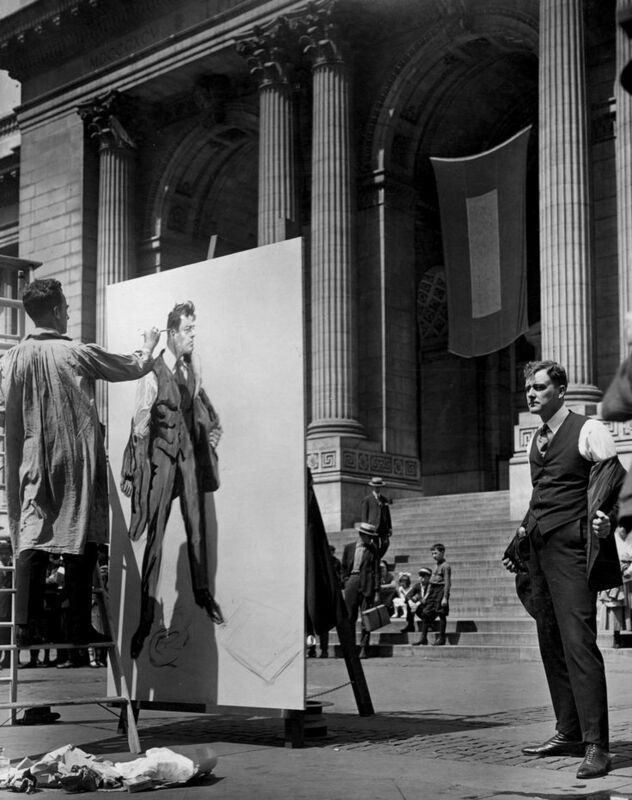 On some occasions, Flagg would offer to draw a portrait on the spot of anyone who pledged to buy a $1,000 Liberty Bond. A platoon of Marines with fixed bayonets marched around him. 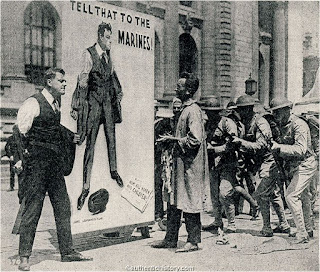 The poster proved so popular that Al Jolson wrote a song based on the line "Tell That to the Marines." This story is one small part of the new issue of Illustration Magazine, which is entirely devoted to James Montgomery Flagg (1877-1960). 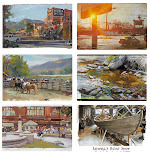 The article is 72 pages long and amply illustrated, with a biography by Dan Zimmer that captures the complexities of the irascible showman-artist. Illustration Magazine's special issue on Flagg. 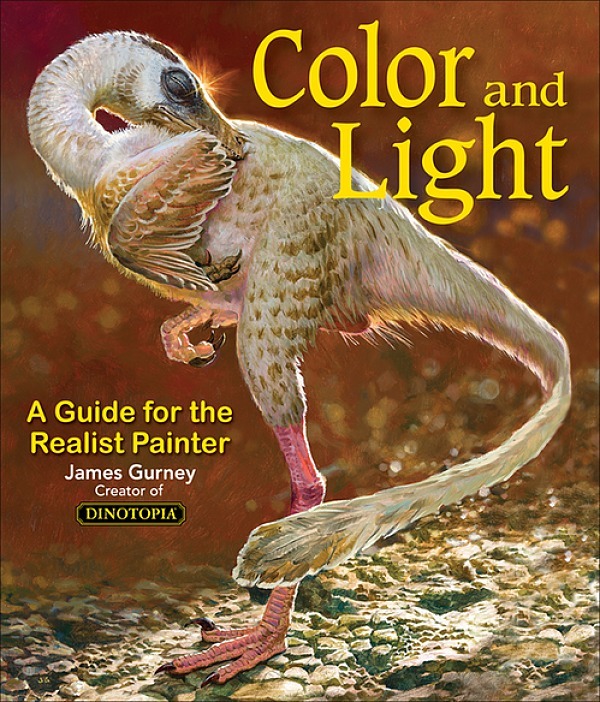 James Montgomery Flagg is the standard monograph. Roses and buckshot is his autobiography. Who are huns and what do I need to tell to the marines? "Hun" was a WWI slur against the Germans. "Tell it to the Marines" seems an odd choice for a recruitment poster. The full expression was, "Tell it to the Marines; the Army will never believe it." This was a joke that came out of inter-service rivalry. The intention was, army were supposedly smarter and harder to fool. The Marines would believe anything you tell them because they weren't very bright. Using the phrase on a recruitment poster seems to suggest a different meaning. If you tell the Marines that "the Huns" are killing women and children, they will kill the Huns. Or some stupid patriotic thing like that. It's all very testosterone-laden. Mark, thanks for explaining that. Every side in that terrible conflict had its posters demonizing the other side and recruiting soldiers to fight. We tend to call it "propaganda art" when it's another country doing it. It's also worth adding that America started out in a more isolationist posture at the beginning of both WWI and WW2, and there was no military draft in 1918. Thanks for sharing this backstory, James. I recently saw this poster at an exhibit called "World War I and American Art" (along with a lot of other great stuff, like Sargent's monumental "Gassed"). I puzzled over the tagline a bit too; the best I could come up with is that the man is supposed to be saying, "Let me at 'em!" or "I'll kill 'em!" or something like that, so he should go tell the Marines to sign him up. Flagg's poster is pretty tame as propaganda goes. That same show featured several butal paintings by George Bellows illustrating German atrocities against Belgian civilians, and a poster depicting Germany as a giant Junker-mustached gorilla abducting a girl (apparently this poster was an inspiration for King Kong).